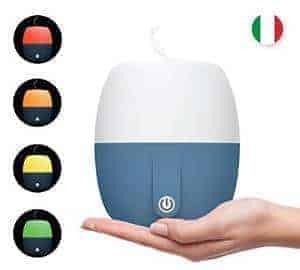 Essential oil diffusers have everything going for them, they are inexpensive, great for your health, beautiful to look at, they add a pleasant fragrance to your home or office, and they make a wonderful gift. Because of the enormous popularity of these fantastic little gadgets, the market is flooded with devices of all shapes and sizes, making it difficult for consumers to determine which product to buy. 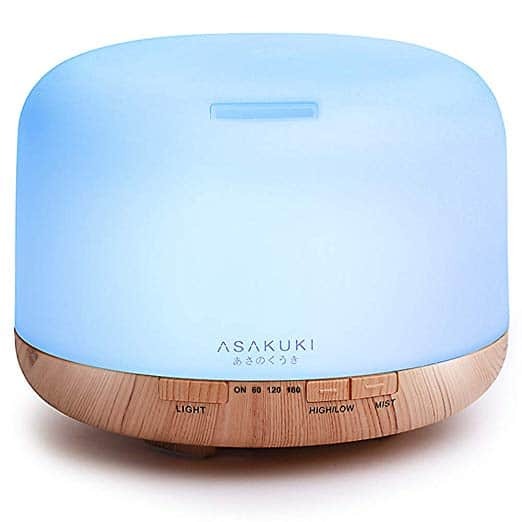 We have compiled a list of 9 of the most popular and best rated essential oil diffusers, along with everything you need to know, to help get you started on your search to find the best aromatherapy diffuser for you. It is a simple, economical design from VicTsing that is quite popular if you want a small option. It will last a bit over 5 hours and puts out the right amount of scent for the size. The small size makes it a good choice for a desk or a smaller space. Users love the price, the high-quality for what you are paying and length of time that it runs for. They also like that turning on the lights is optional. This model is one of the bestsellers on Amazon. It is inexpensive, comes in two colors (light and dark bamboo effect). It runs for up to 6 hours. The capacity of the water chamber is 160mL, so it is perfect for a small to medium size bedroom, office or kitchen. It comes with a 100% satisfaction guarantee. Users love the look and function of the Urpower device. It is a basic model that works well and does what is expected. Reviewers also note that it puts out the right amount of steam so that it fills your room, but doesn’t completely overpower it. One other thing that many customers mention is that it is a very quiet machine, making it great for using it overnight and not disturbing your sleep. This small capacity (120 ml) option is excellent for smaller rooms. It has a good number of programming options including intermittent or continuous misting, as well as different color options (rotate through the colors or stay on one color). It is simple to use, you twist off the top and add your water and your drops of oil into the water chamber. Then you wrap the head back on and turn it on. It comes with a one year warranty. Users love that it works well for such an affordable unit. It is also very quiet and easy to clean, and the auto shut-off works well when the device runs out of the water. Innogear seems to have excellent customer service and is very responsive to user complaints or problems. It is a popular model if you are looking for something with a large capacity. It has a water capacity of 500 ml and a run time of about 16 hours. Most users mention that these diffusers are a great option if you are looking for a large coverage area and long run time. They also like the multiple LED colors and timers. Some users find that the auto shut-off goes on when there is still quite a lot of water in the unit. This beautiful model is straightforward to use, and it has a large capacity of 350 ml. Smiley Daisy also has an excellent customer service reputation. Hibiscus covers around 10 X 20 square feet, although due to the design shape it does auto shut off while there is still quite a lot of water remaining. It comes with a 180-day product replacement warranty. The on/off control has no light, signal or slide location to tell you if you have turned the unit to constant mist, intermittent mist or off. Fairly large shape, not for small night stands or counters. Lull by Quooz has an automatic shut-off, is easy to clean, and can hold up to 200 ml water. Having the ultra-high capacity lets you run the unit all night with the safety feature of automatically turning off when the water runs low. The LED light can be adjusted to desired brightness, or turn it off completely. The intermittent mist function lets users change the diffusion to 20 seconds on 40 seconds off sequences. It comes with a 12- month warranty. Users love that there are two different settings for diffusing, so it doesn’t have to be continually running. The light function works well as a night-light since it is not too bright or you can turn all lights off completely. The large capacity is great for filling large rooms, especially those with high ceilings. This cute little Italian designed unit can run up to 8 hours (has a 140 ml capacity), so you can run it overnight as you sleep. It comes in either a blue or red rubber base. You have a few different options when using this. You can use this model with or without a light. It also has a continuous run option or an intermittent option where it runs for 30 seconds and pauses for 30 seconds. The long cord makes it easy to plug-in more places. The colors on this device are much brighter and bold than some of the other units available. This diffuser is also extremely easy to work as you only have to push the power button to start it. 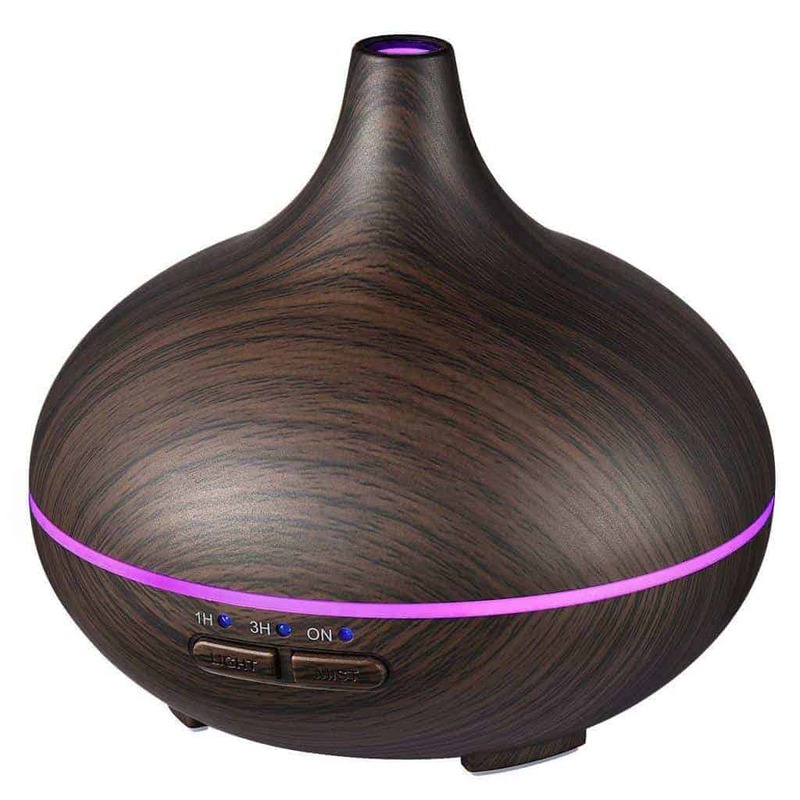 There are a lot of things about this diffuser that customers love. It runs extremely quietly and can use a small amount of water and oil for a long time. It has a very easy to use display: just three buttons, on, off and lights. It’s light, powerful and straightforward. 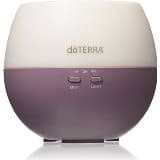 This small, lightweight and inexpensive model is an excellent option if you are looking for a simple entry-level product that can help you get used to essential oils. The unit can run up to 7 hours and can cover up to 250 square feet. The LED colored light option that lets you run through a sequence of lights or have no light on at all. It is nearly silent when running. Users love that it is a simple unit that is easy to use and easy to clean. There aren’t a lot of fancy settings or confusing buttons, and it gets the job done very well due to its strong mist output. Some users find the colors a little too bright. This little unit is pretty basic, but it is very popular. It is great to take with you when you are traveling since it is so small and light. It has seven rotating light colors, so it makes a great starter device for most people. 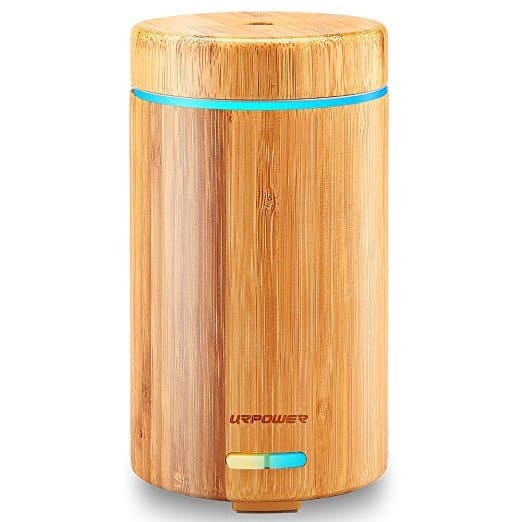 The electric ultrasonic diffuser is very quiet, and it has the standard auto shut-off safety feature. This device also comes with a lifetime warranty. What users love: It is small, so it doesn’t take up a lot of space, but it has a broad base, so it doesn’t tip over easily like some models. It works quickly, misting as soon as you turn it on. It has two modes – continuous diffusing, or 30 seconds on/30 seconds off. Customers love that in addition to having many-colored light options, there is also the option to turn the light off. Immediate steam when you turn it on. Since the water tank is small, you have to refill it often. You can’t turn the light completely off. You can buy a lot of ZAQ products at Walmart. This particular model is a much-loved style but is quite small. It runs for about 5 hours and comes with a 1-year limited warranty. 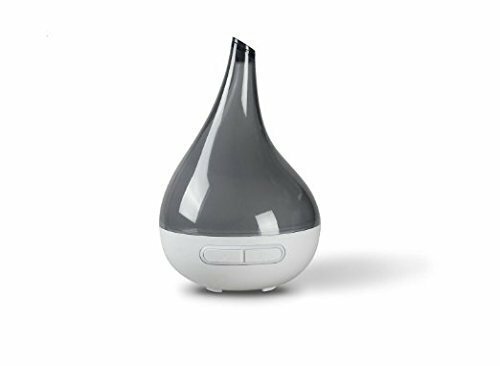 Due to the design, the mist from this model goes higher than the other diffusers and seems to make the essential oil scent travel farther. Since this is a little smaller with a bit of deeper base, you don’t have to worry about spilling water if you need clean the bottom out. In general, diffusers work by distributing essential oil molecules into the air. There are quite a few different ways to diffuse; one of the most natural and most effective ways is by using an Ultrasonic model. Ultrasonic devices use electronic frequencies to create vibrations at a high rate in water that is then carried to the surface where the essential oils are floating. 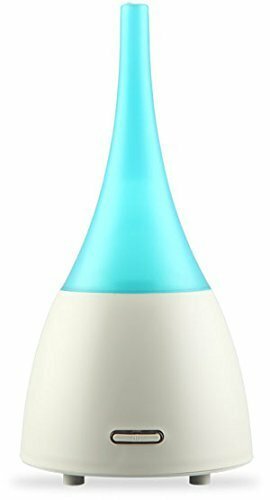 The vibrations vaporize the essential oils into a micro-fine mist and disperse them into the air without using any heat. 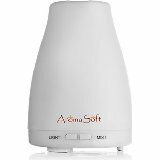 It’s important to mention that when you heat essential oils, some oils lose their therapeutic properties, so for most consumers, it is best to stick with a cold air method of diffusing. 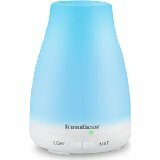 Diffusers are not humidifiers and are not intended to produce the same effect as humidifiers, although most ultrasonic models combine some of the benefits of a humidifier with aromatherapy. The benefits of using an aromatherapy device are almost too many to mention. Depending on the oil that you choose to use, you can refresh, and deodorize the air, which may help with allergies, asthma. The oil that is diffused can make you feel better if you have cold and flu symptoms, eczema, emphysema, etc. They can also help with increasing the flow of oxygen in your body, that can help eliminate stress, headaches and improve your concentration and sleep. Lavender – Can help with relaxation and promotes sleep. Peppermint – It stimulates the mind and helps with mental alertness. Eucalyptus – Is good for individuals who have frequent colds or suffer from allergies. Sweet Orange – Is popular for helping to create a feeling of happiness and warmth. Tea Tree- Is great as an antifungal, and can help kill mold and other bacteria. People use essential oils to help themselves heal mentally, physically, and emotionally. Some individuals use them to help with sicknesses such as flu or allergies or to help relax. Others are concerned about the toxic chemicals used in plug-in air fresheners and scented candles, so they use diffusers as a more natural way to freshen the air and have a pleasant smelling area. There is quite a range of prices for different types of brands, so you can basically get something to fit any type of budget. If you are looking at nebulizers models, they tend to be the most expensive and are generally mostly only used in a professional capacity by certified aromatherapists, trained massage specialists and by skilled professionals in medicine. The more popular Ultrasonic models range in price from around $25 to $70. You can spend much more if you wish, but you can get a great unit that works well and has a lot of features within this price range. You can find diffusers at stores like Bed Bath and Beyond, Walmart and online through manufacturer’s websites or online retailers like Amazon. Be careful using on certain furniture surfaces- in case of leaks. Research any oils you are using, be especially careful with oils you may be diffusing around children or pets (some pets can have severe reactions to certain oils). Follow all manufacturer’s instructions for safe operation. Water Capacity -The larger the water capacity is, the longer it will run for. A bigger water capacity also, obviously, means a larger size of the unit. You can options with 80 to 300 mL water areas. Timer – Timers are a great feature to have to let you customize how long you are going to run the device for. Not a lot of models have timers; you usually have to look at some of the higher end models to find this feature. Automatic Shutoff – Almost all of these types of devices come with an auto shut-off that will give you peace of mind that you can operate the unit without creating a fire hazard. The automatic shut-off works using a sensor that detects when the water level is too low and shuts off the device. Area Coverage – Area coverage is another essential feature to consider. If you are looking to use it in a large room, you will need to look for higher area coverage. Areas range from 200-300-square feet up to 500-square feet. Most manufacturers list the coverage area in the specs for the unit. Cleaning– If you are using the unit daily you will have to clean it about twice a week, so you will want a device that is easy to clean. Most models need a wipe down with a clean cloth or a very mild cleaner. Type of Material it is made of – Diffusers come in ceramic, plastic, wood, and glass. The materials that reputable manufacturers use are safe for all types of 100% essential oils. Operating Time -Smaller units have a lower operating time since they can only hold a certain amount of water. If you are looking to run a unit overnight, make sure you look for a device with a longer operating time. BPA Free-If you are looking to purchase a plastic unit, ensure that it clearly states that it is BPA free. Bisphenol (BPA) is not something that you want in a diffuser that you are going to be using daily. Some essential oil products do contain this chemical which isn’t good for your hormone system. Variable Airflow Output -Look for devices that have an adjustable mist mode settings, and also the ability to alternate the airflow on and off or have continuous diffusion. LED Light Effects -Almost all quality models have a built-in light. They can be used as night-lights or just for a nice mood setting effect. Some allow you to change colors or have a rotating array of colors. If you want to run it at night, but do not light any light when you sleep, ensure that you get a device that lets you turn the light off, some units do not allow you do this. Noise Level -Most consumers do not want a noisy appliance; manufacturers know this, so they include things like Whisper Quiet Technology in their devices. If you are worried about noise levels, check reviews, as most users will mention if it is too noisy. Warranty and Guarantees -The standard is usually a 1-year warranty offered by most manufacturers. You can get more extended warranties, but the minimum you should be looking at is one year. A few of the manufacturers also offer a money back guarantee, which is a useful thing to look for if you aren’t sure about a particular product. Size and Shape -These devices come in a vast range of shapes and sizes to fit almost any type of taste and area of the room. The price tends to go up depending on the water capacity of the model. If you are shopping for a model to fit a particular style of decor, there are many different shapes to choose from including cylinders, flower shape, pyramid, candle shape, circular, etc. 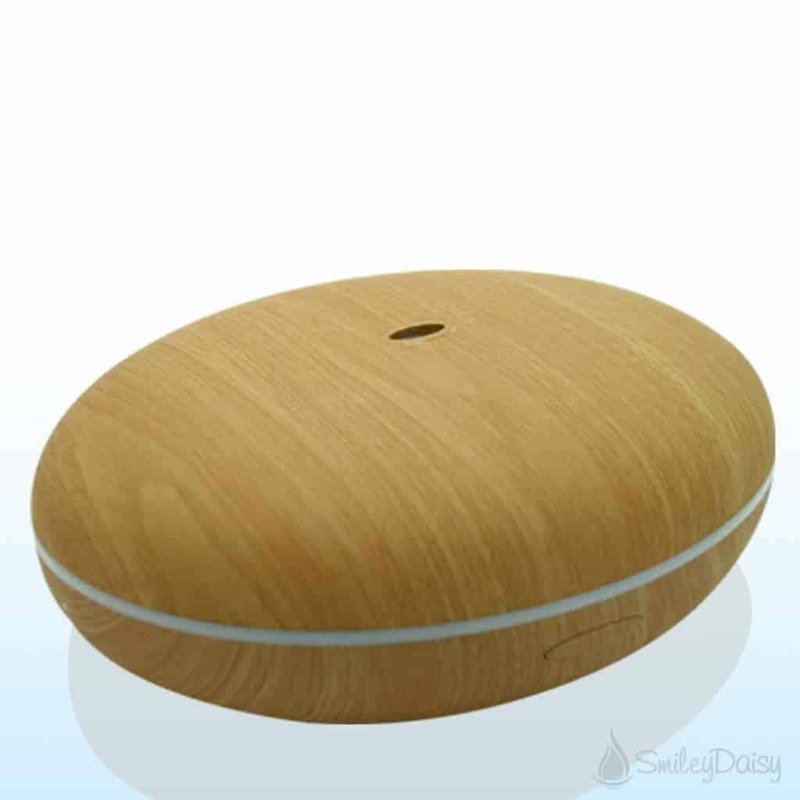 Aromatherapy diffusers are a great addition to any home or office. You can get them for any budget with a wide range of beautiful designs make of different materials like ceramic, plastic, wood, glass and even metal. They are easy to clean and maintain, and very easy to operate. Some have LED lights to create a beautiful calming effect. There are so many diffusers on the market with a bit of research you should be able to find something that fits your needs. Most consumers find them incredibly beneficial to their lives and overall health, and they are well worth the small initial investment.